Here is a test shot with my latest lens for my Nikon D800, a 1970s Nikkor 135mm f2.8 pre Ai prime lens. This photo of my Arri light is shot at f2.8 with no sharpening applied, just watermarked. Nikkor 135mm f2.8 NAI (Pre AI), a photo by MatthewOsbornePhotography_ on Flickr. I love the older Nikon NAI, AI, AI-s lenses. Proper metal and glass construction, nice and weighty and super sharp. My current favourites and probably my highest performing two lenses for my Nikon D800 DSLR are my Nikkor 50mm f1.2 Ai-S and my Nikkor 200mm f2 Ai-S. The Nikkor 135/2.8 completes the trio and replaced my Nikkor 80-200 f2.8 that I recently sold. The 80-200/2.8 was my only zoom lens and left from my Nikon D90 days. My current setup of manual Nikkor primes makes me look forward to using my D800, for both beauty/ fashion portraits and wedding photography. The 135/2.8 gives me that extra reach yet it is a 52mm filter size with built in hood and half the size of the common 70-200/2.8s. Half the size means I am more mobile and I can also get into the action easier at weddings without being seen quite as easily. The eBay purchased lens arrived very dirty but to my relief underneath the skylight filter the glass was in great condition and it cleaned up nicely. Phew! 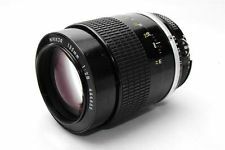 I will use the Nikkor 135/2.8 on my next portrait session and come back with the results soon. In my film days, it was one of my favorite lenses. Now with my D90, along with the 105mm f2.5, it produces super sharp images that stand out from the others I take with the Series G lenses. Mine are like new, mint condition. I will be using them much more since everyone can tell the difference between images made with them vs other lenses. Take care.